1. Cook pasta according to package directions; drain. Keep warm. 2. Cook bacon according to package directions; drain well, and crumble. 3. Beat cream cheese, butter, and Italian seasoning in a medium-size microwave-safe bowl at low speed with an electric mixer until smooth. Gradually add milk, beating until mixture is smooth. 4. Microwave cream cheese mixture at HIGH 3 minutes or until thoroughly heated, whisking every 30 seconds. 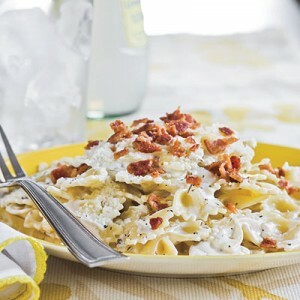 Pour cream cheese mixture over warm pasta, tossing to coat. Top with crumbled bacon and 1/2 cup grated Parmesan cheese.